As difficult as it is to let go of old habits and engrained beliefs, it is something we must do if we are going to tackle the very real issue of obesity in the United States. For more than thirty years we have been entrenched in the belief that dietary fats are the enemy and that strict limitation is the key to health and weight management. While it is easy to assume that the general population simply ignores the recommendations to their own detriment, it is much harder to ignore facts and hard data. In recent months a number of scientific journals have published reviews, editorials and commentaries about carbohydrate restriction as a potential approach for the obese and those with Type II Diabetes. Each has a common thread - the dietary recommendations today lack sufficient scientific evidence to support them. What? Could it be that the recommendations we have in place today are no more than a collection of misinterpreted data and opinions? How about we look at one of the recent articles. In it, he starts by building the case for alternative options based on cold hard data. "According to the USDA Continuing Survey of Food Intakes by Individuals (CSFII), the absolute amount of fat as well as saturated fat consumed has significantly decreased during the obesity epidemic. From a public health perspective, this represents a failure of low-fat/high-carbohydrate strategies to curb the obesity epidemic or at least to negate the other contributing factors such as sedentary lifestyle." He then continues to explore the impact of traditional low-fat recommendations in those with diabetes, examining reports by his own group and others, including national data. "...in a national survey by our group across several health care delivery systems, 3,678 records of diabetic patients were examined with only one-third of the patients achieving HbA1c of less than 7%. "These data, from 2002, are consistent with data from the Third National Health and Nutrition Examination Survey (NHANES III, conducted 1988-1994) and NHANES 1999-2000. Collectively, these data show a consistent pattern of overwhelming obesity and poor control of glycemia and dyslipidemia in the diabetic population despite decades of low-fat recommendations." He believes this hard data points to the need explore alternative dietary approaches. High on the list of alternatives is carbohydrate restriction. His reasoning? "... the current evidence for its effectiveness." First up in the current evidence - two large, long-term studies - the Nurses Health Study and the Health Professional Follow-Up Study. Both studies show that dietary carbohydrate intake (measured as glycemic load) is linked with the risk of type 2 diabetes and CVD. The use of glycemic load as a measure helps to determine the quality and quantity of the carbohydrate in the overall diet. He continues with current prospective cohort studies which show worsening of glycemic control and dyslipidemia in diabetic patients with a high-carbohydrate diets, while showing how carbohydrate restriction may actually reverse these serious metabolic abnormalities. He continues with, "[t]his concern, however, has not been substantiated, and at least two studies show that low-carbohydrate diets are not associated with increase in dietary intake of proteins or fats presumably due to effect of these diets on satiety." Throughout the rest of the editorial, he explores each of the benefits noted in various studies - glycemic control, reduction of postprandial hyperglycemia, improvements in dyslipidemia, increased insulin sensitivity, and reduction in antidiabetic medication in diabetics. Sadly, he felt he needed to state within his editorial that "Because of the somewhat contentious atmosphere surrounding this subject, I feel obligated to point out that I am not supported or affiliated in any way with any individual or entity that promotes a particular diet." Isn't this about science - the evidence and hard data? While I wish he didn't need to make such a statement, I understand his reasons. The current atmosphere around anyone advancing the scientific evidence that supports carbohydrate restriction today is indeed critical and filled with suspicion of influence from vested-interest parties; as if the science itself is not main driving force. After his disclaimer, he states, "This editorial is intended to stimulate a scientific and scholarly debate that will lead to more effective dietary recommendations that take account of the current evidence for carbohydrate restriction. This will thereby provide more options to our patients and our society at large in the current struggle with the epidemic of obesity and diabetes, which is claiming thousands of lives daily and leaving many people disabled." He wraps up the editorial quite nicely with "It is also important to establish guidelines for carbohydrate restriction, especially emphasizing the use of mono- and polyunsaturated fats as a way to achieve caloric balance, since these have been inversely linked with CVD risk. I also believe that clinical trials need to be conducted using graded levels of carbohydrate restriction and fat intake, with special emphasis on unsaturated fats, to examine their effects on weight loss, glycemic control, insulin resistance and CVD. An open-minded analysis of such experiments is needed to resolve the present controversy about optimal dietary recommendations for patients with diabetes." Can you hear me saying "Yeah!" For years I've been saying "we need to be strictly committed to the scientific evidence" to establish evidence-based recommendations. When the 2005 Dietary Guidelines for Americans were released, I was highly critical of the lack of references to the data that was supposedly used to formulate the recommendations. I've continued to advocate for more individualized approaches and options in the "toolbox" and will continue to do so in the future. We know there is no one dietary approach that works for everyone. It is high time the medical and scientific communities publically acknowledged such and started the process to develop clinical guidelines for the various approaches that are supported by evidence and hard data. Such guidelines would provide healthcare professionals with useful options and tools for their patients - each of whom is an individual in need of a "diet" that is best suited for their individual needs! After you've had some time to read the above editorial, you might want to write to the Editor of Endocrine Today to express your appreciation for publishing what is, sadly, a highly contentious issue! Want to see a good example of disagreement within the scientific community? Not only disagreement, but a disagreement that is based soley on the interpretation and use of scientific evidence. Here in the United States, one of the leading medical organizations, the American Heart Association (AHA), continues to recommend that everyone to limit their consumption of eggs due to the cholesterol contained within the yolk. In fact, the upper limit per day is maybe one egg and that's IF total dietary cholesterol intake from all sources is within the AHA recommended upper limit of 300mg per day. A large egg contains about 213mg of cholesterol, so one egg per day is probably unrealistic due to cholesterol in other foods that are part of the diet. The AHA even clarified this restriction on their website to ensure anyone thinking that an egg a day is okay would understand that is not the AHA position! In other countries, the medical organizations that are comparable to our American Heart Association take a different view. Take the National Heart Foundation (NHF) in Australia. Not only do they make no recommendation to limit egg consumption in healthy individuals, they have given eggs the "National Heart Foundation Tick" (the equivalent of the AHA 'heart-check' logo in the United States). The Tick is all about quickly highlighting healthier choices for the general population. Sometimes Tick also needs to help dispel myths and remind people that nutritious foods like eggs, lean meat and poultry, plain unsalted nuts and avocadoes are an important part of healthy eating. So, the NHF in Australia considers the AHA position to be one built on myths, not scientific evidence! They do make it clear that those with heart disease will need to work with their healthcare professional to assess whether including foods higher in cholesterol is appropriate, but for healthy individuals there is no restriction. The Heart Foundation does not restrict consumption of eggs for the general population. For healthy people, the best guide is to include a wide variety of nutritious foods, including eggs. People at risk of or living with heart disease may still be able to eat eggs but they should discuss their intake of egg yolks with their doctor or Accredited Practising Dietitian. Here is where the Australian NHF is doing a much better job in communicating with their population than the AHA is doing here in the United States. The NHF is using the evidence while the AHA continues with the "conventional wisdom" that holds that the recommendations developed for those with disease or at high risk for disease should be streamlined to the general population to reduce risk. It isn't that the scientists and researchers in the US don't know that the evidence shows that there is a segment of the population that should limit cholesterol - this is well known within scientific circles, and is a segment of the population known as "responders" to cholesterol in the diet. From my understanding, those who are "responders" represent about 10% of the general population. Which leaves 90% of the population unaffected by dietary cholesterol intake. Yet, the recommendations in the US are based on that small population of people instead of recommending testing to determine if one is a responder or not. In a recent Lean Plate Club column, Alice Lichtenstein, a professor of nutrition at Tuft's University was quoted as saying, "Some people are responders, some people are not. If you're not, then there's no reason to be concerned, but the only way you can tell is by getting a blood cholesterol test." So you know, it isn't a single test either, but atleast two tests done months apart, to measure the effect of including dietary cholesterol foods on your cholesterol levels. But, rather than make recommendations toward healthy individuals and separate recommendations for those with disease or high risk, the current recommendations ignore the healthy and continue to recommend for the general population what is more appropriate for the sick in an effort to try to reduce the risk of those who are healthy. The real question we need to ask and seek an answer to is this - have the recommendations, when actually followed by healthy individuals over a long-term period, worked to improve their long-term health AND reduced their risk of disease? To date there is no convincing evidence that a healthy individual, specifically one who is not a "responder," should limit their intake of eggs or dietary cholesterol below 300mg per day. What is much more important to the overall achievement of good health and well-being is the quality of the foods you eat and their nutrient-density and eggs meet that standard for healthy people! The press today is buzzing about the Partnership to Promote Healthy Eating and Active Living that has organized a national initiative, "America on the Move," to encourage healthy eating and increased physical activity for individuals and groups of people interested in participating together. Tomorrow, September 28th, is designated as the "Day of Action" to sign up and be entered into a drawing for a number of prizes. Sounds good so far, doesn't it? America on the Move is sponsored by Pepsico. That's right, the makers of Pepsi, Frito-Lays Chips, Gatorade and Tropicana Juice among other things. Couldn't the organizers find any non-food industry sponsor, like say, a pedometer manufacturer - which would have been more appropriate? Are you starting to see a common thread here? The vast majority of the sponsors have a vested interest in you eating their products, many which are not exactly your best options for healthy eating! While I applaude the idea to start a national initiative to encourage people to eat healthy and get more active, I remain suspicious of an organization that relies so heavily on food industry money. The conflict of interest is so glaring in this organization, that I have to wonder if its initative, America on the Move was started as a public relations effort by the food companies that are right now in the cross-hairs of the national debate on the obesity epidemic we're facing. I think what we need is a national organization that is founded, supported and financed exclusively by researchers, scientists and medical professionals and is dedicated to the science, without interference or influence from industry. Industry has too much at stake to be part of the debate - the temptation to sway the interpretation of the data too great. Yesterday the World Health Organization warned that more than 1 billion people worldwide are overweight and that if the trend continues, the number will increase to 1.5 billion by 2015. “The sheer magnitude of the overweight and obesity problem is staggering,” WHO Assistant Director-General of Non-communicable Diseases and Mental Health Catherine Le-Galès Camus said in the warning, issued ahead World Heart Day on 25 September. Throught the above article, a number of statistics were presented and the rising rates of obesity were stated as being caused by a global shift in diet towards increased energy, fat, salt and sugar intake, and a trend towards decreased physical activity due to the sedentary nature of modern work and transportation, and increasing urbanisation. More of the same "calories in calories out" explanation. Don't get me wrong, calories do count in the weight gain-weight loss equation, but few are asking the harder question - why are we suddenly eating more calories as our requirement for calories is in decline with less activity? If you look at the data, the situation isn't simply we're moving less while eating the same. Not only are we moving less, we are eating more calories. Throughout our evolutionary history, we've encountered situations of feast and famine and at no time in the past experienced such a dramatic surge in large segments of the population growing too large. There have always been, and will always be, a small percentage of the population that are overweight or obese. There have been, and will always be a small percentage of the population that are underweight. These two facts are givens. The real issue is not these two ends of the spectrum populations. The vast majority of humans, around the world, could be said to be part of the "middle population" - those who, until recently, always maintained a weight within a normal range in conditions other than famine. Over the last thirty odd years, the focus of the medical and scientific communities and public policy makers has remained "calories in calories out" and "eat less and move more." These are concepts even a child can understand and even though oft repeated, has done nothing to stop the rise of overweight and obesity in the United States or globally. So, the question begs, is the message ignored or is the message wrong? Many would contend that the message is simply being ignored. And on some level, I would agree - there are some who simply will not heed any warnings and will not alter eating habits which are leading to their weight gain. But to say that every person - 1 billion people now - are just ignoring the facts and doing nothing to change their overweight condition is ignoring the fact that the calorie theory might be wrong on some level. Think about that for a moment. What is the likelihood that one billion people don't understand "eat less calories and/or move more"? Now, what is the likelihood that, given we've had thirty years of this message...if it really was the solution, if it really worked when followed....what is the likelihood we would still be seeing an alarming rise in the rates of overweight and obesity? With that in mind, I contend that it is not simply the calories, but the type of calories that are far more important in the equation. We have data available from the last thirty years that consistently shows that it is a small minority who successfully are able to lose the weight and keep it off with the "eat less and/or move more" solution. Some will say that the majority who are unable to do so simply stopped following this workable approach and if they would just do it, they too would be successful in losing the weight and keeping it off. To me, this is a very simple minded perspective that fails to ask why so many fail in their attempts to follow what should be an easy solution. Rather than ask if the problem is the solution, they'll seek to blame the individual who has failed instead of working to find a solution that will work. It's a good thing that not everyone has tunnel vision about the issue. While still in the minority of those researching the causes and solutions of the obesity epidemic, a number of researchers are finding that it isn't just the calories, but the quality of the calories; the form the calories are delivered in; and the overall quality of the nutrient load provided by the calories. With one billion people already overweight globally, and that number continuing to grow daily, we need real solutions to reverse this trend. The solution is not a simple "calories in calorie out" equation, but much more complex than that. In know for myself, simply eating less calories by following a calorie-restricted plan didn't work well. It took a radical change in my diet, from one that was heavy with starches and carbohydrates to one that was rich with nutrients but much lower in carbohydrates to effectively enable weight loss and maintenance of that weight loss. While my diet today would be best described as "controlled carbohydrate," it is still maligned by those making dietary recommendations because, even though it is heavy with vegetables, it lacks what is considered adequate intake of grains; even though it is nutritionally complete from just my food intake, it lacks what is considered a "balanced" variety of all the food groups. Given the fact that there is no one approach that is going to work, it is high time the medical establishment and public policy makers begin to open their minds to the fact that there are a number of ways to approach weight loss and management and stop recommending the single, low-fat, high carbohydrate approach as the solution for the obesity epidemic. We have one billion people who need access to the information about the various dietary approaches that have been shown to work. We need a working "tool box" of solutions available to physicians and nutritionists to offer their patients instead of the continued "if you just eat less and exercise more" routine that is clearly not working! Researchers at the University of California, San Diego (UCSD) School of Medicine have reported in RxPG News that chronically high levels of insulin, as is found in many people with obesity and Type II diabetes, may block specific hormones that trigger energy release into the body. In other words, high insulin levels inhibit the use of body fat for energy in the body. The researchers found in their studies that high levels of insulin can block stress hormones known as catecholamines, which normally cause the release of cellular energy. Adrenaline is the best known example of a catecholamine. For normal metabolism to occur, the body needs a balanced input of insulin and catecholamines. One of the actions of insulin --, the main energy storage hormone, is to block activation of the protein kinase A (PKA) enzyme. After a meal, insulin levels go up, and the body stores energy primarily as triglycerides, or fat, in adipose tissue to be used later. When energy is needed, catecholamine triggers activation of PKA, and energy is released. But in people with Type II diabetes, the hormonal balance has been thrown off, because the body continues to produce and store more triglyceride instead of breaking down the fat as released energy. The findings provide additional understanding to the cause and effect occurring when insulin levels are chronically too high. We know that as insulin levels go up and the body loses the ability to effectively use it, so it makes more, bringing insulin levels even higher as the body struggles with what is called insulin resistence. Insulin resistence is a pre-cursor to Type II diabetes. Overweight and obesity is seen in the vast majority of those with insulin resistence and Type II diabetes due to the chronic storage of fat in the body. In lay terms, one gets fatter as their ability to effectively use insulin diminishes and their body makes more insulin, thus storing more energy as fat, in an effort to compensate for the insulin resistence. It really is a vicious cycle. Now while the article continues to say that this data underscores the goal to bring down insulin levels - which I agree with - it fails to fully explore options other than using medications known as insulin sensitizers. Too often, the medical community is dependent on the thinking that "managing" the problem with drugs is the short and long-term solution. While such an approach may be an effective short-term aid to bring things under control, it fails to address the need to reverse and eliminate the underlying cause of the chronic high insulin - poor diet. We know from dozens of research studies that reducing carbohydrate, especially refined carbohydrates and sugars, stabilizes insulin levels and reduces the effects of insulin resistence. This is due, in part, to the lower levels of insulin required with less carbohydrate being metabolized to glucose, which in turn stimulates insulin, which in turn (especially when insulin resistence is present) leads to energy storage as fat. So, reducing carbohydrate intake is one effective dietary approach that can improve insulin sensitivity. There are a number of controlled carbohydrate approaches available - everything from very low carbohydrate diets (Atkins) to moderate controlled carbohydrate diets (Zone) with a number of plans between the two ends of the spectrum of carbohydrate restriction (South Beach). No matter what approach you choose, one thing is important - this is not a short-term, temporary fix. It is something that you will need to follow for the long-term so choosing a plan you can live with for the long-term is key. When the story of John Keitz, the 39-year-old Dundalk, Maryland man who weighed 625-pounds, ran in the Washington Post back in June, I decided not to include the story of his determination to lose weight in my blog until updates on his progress were encouraging. Sadly such an update will not be coming in the future - John Keitz died yesterday at 750-pounds. His story is one riddled with contradiction - by all accounts, he was a charismatic gentleman, though with time he grew fatalistic about his weight; a man with an over-sized personality and an over-sized body; a happy-go-lucky sort who simply gave up and resigned himself to a bedridden state for seven years as he grew larger and larger. In June when the Washington Post ran his story, I was shocked by the photos and the state of disarray his life was in. In the seven years since he'd fallen one evening while making dinner, the fall that ultimately led him to bed, he'd gone from 500-pounds to 625-pounds. He decided it was time to get help and was admitted to a facility near Annapolis, Maryland - eager to lose the weight and become "functional" again. He had a good start to his weight-loss as the high-profile story in June recounted. Somehow, though, things turned for the worse over the summer. He had stopped complying with his diet and was gaining weight again. He wound up being admitted in late August to another facility in Ohio for treatment - upon admittance he was up to 752-pounds. A month later he was dead. One has to seriously ask, just how can this happen? How can one, living with obesity, go from (no doubt) a difficult existence due to what can only be considered extreme-morbid obesity at 500-pounds, to a bed-ridden 625-pounds, to someone who finally seeks treatment and actually gains more weight while being treated for obesity - reaching a remarkable 752-pounds in less than three months? How does someone actually eat an excess of 444,500 calories in about 90-days, day-in-day-out consistently, to gain 127 pounds while he is being treated in two facilities? That's right, this man had to be eating 4,938 excess calories each day! What were they feeding him? Someone was responsible for providing him with food - he was bedridden and obviously not able to walk to the refrigerator and help himself to whatever was in there! If you haven't noticed, I am a bit shocked by this story. Here was a man, a severely obese man, who needed help; whose life had moved beyond routine existence as a morbidly obese man to an existence that can be only described as abnormal. The abnormal somehow became routine and acceptable in his life and the lives of those around him. Call me opinionated if you must, but I think his story is one that serves as a warning to anyone who is obese and slowly watching their life morph into a reality they wouldn't have considered normal in years past. Take this example of a 39-year-old John Keitz and realize such altered reality happens to real people slowly, over time. Don't wait until you're bedridden, don't wait until you can no longer roll over in bed and are still gaining weight, don't wait until years have passed in such a state....do something today. I've said it many times, you have the power to change you life - do what you must do and don't allow yourself to become another tragic story! When I stop into one of the local coffee shops to grab a cup of joe, I don't usually worry myself with the details about what it is made with. Then again, I typically order a coffee and add my own creamer and sometimes a bit of sugar, at most a teaspoon. But what if you do order one of the specialty blends offered on the menu board? Say, a venti Starbucks Carmel Chocolate Frappuccino. Do you know what you're getting? Well, Starbucks has the nutrition facts on their website in an easy-to-use format - it's also an eye-opener! That venti Carmel Chocolate Frappuccino, with whipped cream - a whopping 730-calories! But here is the really *disgusting* bit of information: that cup of coffee has 117g of total carbohydrate, of which 97g are sugar! That's right - more than 24-teaspoons, you read that right 24-teaspoons of sugar in the cup of coffee. Good grief! People pay for this? Pay to have someone else make their cup of coffee with an unbelievable amount of sugar in it? Honestly, would you order a plain cup of coffee and then proceed to add 24+ teaspoons of sugar yourself? Here's a more alarming visual - that's more than a 1/2 cup of added sugar! Would you ever consider adding that much sugar to your coffee? Grabbing a coffee on the run may be convenient, but it's important to be aware of what you're getting! Before you order blindly, ask to see the nutrition facts for the various offerings - if they're not available, stick with ordering a regular cup of coffee and add your own creamer and sweetener. That way you're not unwittingly sabatoging your diet or your health with insane amounts of added sugar! This week, Jimmy Moore, in his blog Living La Vida Low-Carb, unwittingly revealed a dark side to "medical weight management" - that is doctor-designed weight loss programs that one can only follow under the care of the physician promoting the plan. While he blogged about the "Cookie Diet" promoted by Siegel Medical Weight Management, he didn't dig deeper to see how prevalent such "special" programs are. Information about such programs is often marketed on websites that are vague about exactly how they work, how much they cost, and how the patient is followed while on the program. For that information one must go to the doctor for a consultation. "600,000 patients since 1970" or "over twenty-six years, this program has been used by physicians...to help thousands of patients"
"Formulated by physicians who specialize in weight loss clinics..."
"...medically supervised weight loss program..."
"...program has its advantage as being simple..." or "...menus you can live with..."
"...clinically proven..." or "...program that is 75-90% successful..."
"Individualized programs to lose weight successfully..." or "individualized program of proper diet and nutrition"
The claims on the various websites are truly amazing - high success rates, easy weight loss, successful long term weight management of their patients, and very easy-to-follow plans while under the care of a doctor. So, what's the catch? Like any weight loss diet, if it sounds too good to be true, it probably is. The big difference between the "medical weight management" programs and the commerical plans out there is the belief, held by many, that if a doctor is overseeing the program, it is somehow a healthier approach to weight loss. But, as Jimmy Moore revealed, some of the programs are often riddled with "gimmicks" like special cookies. A review of the Google results shows other gimmicks are promoted too - everything from cookies to bread to pre-packaged meals to specially formulated supplements. All available only from the doctor promoting the program. The other thing that appears to be only available from the doctor is the details about what you can actually eat while losing weight - in the sites that touted incredibly high success rates, claims of decades of success with thousands of patients and had a special product as part of their plan, not one offered a sample menu. What a good number did offer though was reference to appetite suppressants for "those who qualify." Even the Cookie Diet includes appetite suppressants, available from the doctor and included in the monthly program fee! "Many patients, in addition to The Siegal Cookie, are prescribed appetite suppressing medications along with other substances. When prescribed, these medications are dispensed from our own clinic, eliminating the need and expense of having the prescription filled at a pharmacy. Incidentally, all of these medications are included in our one monthly fee." In fact, over 2,000 of the websites that I found included justification and rationalization for including appetite suppressants. When a physician is heavily promoting their own weight loss program, available only when you are their patient, and it includes the use of appetite suppressants, you can be pretty sure the plan is a very low-calorie diet - "gimmick" foods or supplements included or not. Unfortunately, as the epidemic of obesity continues to rise in the United States the opportunity to promote "special" physician designed programs grows. This isn't to say they're all rubbish or stretching the truth in their claims. What it is saying is that consumers, those who need to lose weight the most, must be cautious in their search for a doctor to help them in their weight loss effort. Are they claiming decades of use of the program? Are they claiming successful weight loss for tens of thousands of patients? Are they claiming successful weight maintenance for tens of thousands of patients? In their marketing, are they vague about what you can eat? In their marketing, are they vague about how many calories you'll eat? Are they claiming a special "physician created" plan they designed that is only available when you are their patient? Do they have special "gimmick" foods like cookies, breads, pre-packaged foods and/or supplements you must use while on their plan? Do they promote the use of appetite suppressants? If they do, do they dispense them from their office rather than have you fill your prescription at the pharmacy? Does their monthly fee include appetite suppressants? If you do not use them, is your monthly fee less? How exactly do they individualize the program? There are very good medical weight management programs available. Many are available through hospitals and have research data published about their program protocols and success rates. The biggest red flag with any of the medical weight management programs is how they are marketed - if they are heavily promoted online, making big claims with vague details odds are high they're a gimmick. Sadly, the doctors promoting these programs truly believe they are doing a service, yet will not share their "secrets" with their colleagues or the scientific community. When you're searching for the doctor to help you lose weight, my best advice is Caveat emptor, Latin for "let the buyer beware". The cookies designed to be lower in fat and still taste good? They were the first attempt by Kraft to jump on a trend sweeping the nation. In this instance, it was a low-fat diet that was capturing the attention of Americans and policy makers. It didn't matter that Snackwells did nothing to help you lose weight - they were promoted as low in fat and relied on the "everything in moderation" mantra for consumers to eat 'em up. It didn't matter they were just another food that was filled with empty calories, nutritionally bankrupt. Consumers wanted to believe they could eat anything in moderation. But then they didn't lose weight - and perhaps even gained some. So fast forward - the next big trend is low-carb. You can bet Kraft Foods was poised to jump into that one too! Indeed, they did - with the South Beach Diet foods line. And yes, there are South Beach Diet Cookies too! These cookies are promoted as a "wholesome source for on-the-go snacking" - too bad they're anything but "nutritious." Yes, these too are a shining example of empty calories touted as acceptable...afterall, "everything in moderation," right? So where do you think Kraft Foods is going now? That's right - jumping right into the newest trend, "whole grains." And they have cookies just for that too. Kraft unveiled two new products at - of all places - a nutrition and obesity conference in Sacramento, California....Chips Ahoy Cookies and Fig Newtons, both now available with whole grains. They're even being promoted as "wholesome" like the South Beach Diet cookies too! Kraft Foods is seriously hoping consumers haven't learned the hard lesson that empty calories and nutritionally bankrupt snacks are simply junk food - they're not healthy (as Snackwells are promoted) and they're not wholesome (as South Beach Diet Cookies and the new whole grain Chips Ahoy and Fig Newtons are promoted). I have a better idea. Kraft Foods should go back to the basics - make cookies and forget about the diet trends. Cookies are not diet food; do not help you lose weight; do not provide any real measure of essential nutrients; and are not wholesome or healthy options. They're cookies - junk snack food, pure and simple. And, that's not necessarily a bad thing folks! But let's stop pretending that cookies can or should be part of a weight-loss diet or even a snack eaten each day, even in "moderation." Part 3: Nutrient density by macronutrient type and how to increase your intake of essential nutrients to optimize health. In this three part series looking at low-carb diets versus low-fat diets, I've discussed in Part 1 why the percentage of calories from fat is not a measure of quality in your diet. In Part 2 I compared, side-by-side, a very low-carb menu with a very low-fat menu and exposed the nutrient deficiency caused by decreased intake of fat and protein that is necessary to maintain macronutrient mix based on the recommendations for percentage of calories in the diet. Today we'll explore the various macronutrients and why the focus must shift to nutrient-density from micronutrients and essential nutrients in the foods you eat and not the percentage of calories each day from macronutrients. For decades our dietary recommendations have undervalued protein in the diet, offering a recommended intake ranging from 10% to 35%, with intake levels set to balance intake of carbohydrate and fat. Not only that, but protein from plant sources is basically viewed as the same as protein from animal sources when it is not the same. Yet if we look at the word "protein," we find that its origin is significant - French protéine, from Late Greek prōteios, of the first quality, from Greek prōtos, first. Of first quality? First? Say what? Something our ancestors understood all too well - protein is of utmost importance in our diet, something reflected in the root meaning of the word itself. Why exactly is protein important? Well, for one thing, the human body requires that we provide, through our intake of food, amino acids from protein sources. These amino acids are called "essential amino acids" because our body cannot make them from within. There are a total of twenty amino acids available from protein sources, of which eight are essential and two are conditionally essential. If you do not eat foods with adequate levels of the essential amino acids, you're failing to provide your body with what it requires to function and build and repair cells. Proteins are involved in practically every function performed by cells, so why do we place such little value on it in our recommendations? In part, as stated by the Institute of Medicine (IOM) in their documentation for recommended levels of intake, While no defined intake level at which potential adverse effects of protein was identified, the upper end of the AMDR (acceptable macronutrient distribution range) [was] based on complementing the ADMR for carbohydrate and fat for the various age groups. There you have it - to maintain the recommendation - the party-line - of no more than 30% of calories from fat, the recommendation for protein was established not on evidence and data, but to maintain the percentage of calories from fat and carbohydrate! So what happens when you consume too little protein and thus too few essential amino acids? Protein deficiency can lead to symptoms such as fatigue, insulin resistance, hair loss, loss of hair pigment, loss of muscle mass, allergies, heart disease, low body temperature, and hormonal irregularities. I can't stress this enough - protein is critical in your diet. And not just any protein - you need a complete complement of all the essential proteins each day. Otherwise, you're unwittingly undermining your long-term health and vitality. As the Biology Project at the University of Arizona states in their documentation of amino acids, Failure to obtain enough of even 1 of the 10 essential amino acids, those that we cannot make, results in degradation of the body's proteins—muscle and so forth—to obtain the one amino acid that is needed. Unlike fat and starch, the human body does not store excess amino acids for later use—the amino acids must be in the food every day. Why is it difficult to consume enough complete-quality protein when fat is limited? Because the sources of complete-quality protein ALL contain fat and are virtually all animal sources. Which brings me to the next macronutrient - fat - that our dietary recommendations insist must be limited to 30% or less of calories each day. Not only that, but no more than 10% of total calories are recommended from saturated fat. Surely such a recommendation must be rooted in evidence that supports limiting fat intake? Well, again, let's look at the IOM documentation statement: While no defined intake level at which potential adverse effects of total fat was identified, the upper end of the AMDR is based on decreasing risk of chronic disease and providing adequate intake of other macronutrients. Did you catch that? The upper limit, 35% of calories from fat, is not supported by research evidence and data - but like the AMDR for protein, is set to maintain the party-line recommendations for macronutrients as a percentage of calories each day! So, do we really need fat in our diet? Is it even reasonable to put forth contentions that having a higher percentage of calories from fat may be better in the long-term for health? Like protein, we have dietary requirements for what are called essential fatty acids (EFA) that are provided in our food from fats within the food. There are dietary requirements for two essential fatty acids - Linoleic Acid (LA) an omega-6 and Alpha Linolenic Acid (ALA) an omega-3. As hundreds of studies over the last five years are bringing to light, we're consuming too much LA (omega-6) and not enough ALA (omega-3). And this is a direct consequence of the shift we've made in the last thirty years in not only how much fat we consume but what types of fat we eat. Add to this, our increased consumption of foods that have removed or reduced fat and are promoted like skim milk and reduced fat cheese. Guess what? Whole milk, cream, half-and-half and natural full-fat cheese all have a balance of ALA and LA. Oh, and they're also sources of complete-quality protein too! Why are EFA's so important? They support the cardiovascular, reproductive, immune, and nervous systems. As Pam Rotella (a vegetarian I might add) states on her Essential Fatty Acids page: The human body needs EFAs to manufacture and repair cell membranes, enabling the cells to obtain optimum nutrition and expel harmful waste products. A primary function of EFAs is the production of prostaglandins, which regulate body functions such as heart rate, blood pressure, blood clotting, fertility, conception, and play a role in immune function by regulating inflammation and encouraging the body to fight infection. Essential Fatty Acids are also needed for proper growth in children, particularly for neural development and maturation of sensory systems, with male children having higher needs than females. Fetuses and breast-fed infants also require an adequate supply of EFAs through the mother's dietary intake. So, like protein, our bodies require particular fats each day from our diet. While many sites online promote the plant based and marine sources of ALA, they fail to mention its presence in animal fats, and play-down the often too high levels of LA in many oils promoted to reduce intake of saturated fat. That's right, we're eating five-times the LA in our diet to ALA and the excess is believed to have negative effects on our health. So what are good sources of ALA? Eggs, cream, fatty fish, fish oils, flaxseeds, flax oil, dark green leafy vegetables, cruciferous vegetables, root vegetables, red meats, cheese (natural) and a variety of nuts and seeds and even some spices like oregano and cloves. Yet many of these foods are avoided in our diet. What happens if you're deficient in omega-3 or have a too high ratio of omega-6 to omega-3? The symptoms of omega 3 fatty acid deficiency or omega-6 excess include fatigue, dry or itchy skin, brittle hair and nails, constipation, frequent colds, depression, poor concentration, lack of physical endurance, and/or joint pain. In our efforts to reduce fat intake and avoid saturated fats, we've skewed our intake ratios of omega-3 and omega-6 and in the process also increased our intake of a deadly man-made fat found in partially hydrogenated fat - trans fatty acids. As Dr. Mary Enig states in her paper, Health Issues and Trans-fats, [b]ecause trans fatty acids disrupt cellular function, they affect many enzymes such as the delta-6 desaturase and consequently interfere with the necessary conversions of both the omega-6 and the omega-3 essential fatty acids to their elongated forms and consequently escalate the adverse effects of essential fatty acid deficiency. She continues by adding, The fats that humans have consumed for millennia, such as the fats that they added to mixed dishes, were almost always more saturated than they were unsaturated. It was the easily extractable fat or oil, the fat that came from the animal, or, in the case of areas such as the tropics, it was the oil that came from the coconut or the palm fruit that was used in cooking. Sometimes it was one of the very stable oils like olive oil (or sesame paste) that had a lot of built-in antioxidant and wasn't too polyunsaturated. People didn't really have the ability to extract oil from vegetables like corn, or from many seeds as they do today. However, they got their essential polyunsaturated fatty acids from many of these plants when they were included in the foods they were eating. People used the intact leaf, root, nut, grain or seed along with all its antioxidants in the stews or the porridges that most people ate. This was the way the polyunsaturates were historically consumed. The polyunsaturated fatty acids didn't have to be hydrogenated to protect their integrity and keep them from going rancid because they were consumed in a protected whole-food state. It is only in modern times that we avoid saturated fats and consume oils that are high in omega-6 and man-made trans-fats. The question begs - why? Why not eat a full range of foods, whole foods, including those that may be higher in saturated fat to unsaturated fat? Which brings me to the real issue - we've migrated away from our traditional dietary habits of eating real whole foods - which included natural fats and oils - and now consume much more processed packaged food, highly refined food and convenience food - which includes man-made trans-fats, chemicals, added sugars and less essential, critical nutrients. And so we're back to nutrients. We're told that we must consume a high percentage of our diet from carbohydrate foods to meet our essential nutrient requirements. Funny thing here is that unlike protein or fat, we have no essential requirement for "carbohydrate" - what we require are vitamins, minerals and trace elements - found in various foods we eat. Here is something that is not so funny - if we eat a diet that provides adequate intake of our essential amino acids and our essential fatty acid requirements, we often meet or exceed our requirement for vitamins and minerals too - with or without carbohydrate foods like grains, fruits and starchy vegetables. We've been fed a package of "big fat lies" when it comes to our nutritional requirements. The focus has been, for the last three decades, to reduce fat intake. The consequence is that we've listened, we consume less fat, less saturated fat and eat much more carbohydrate than ever before. Yet, we remain - I contend - malnourished...starving for our essential nutrients because we are not eating a "balanced diet" to provide our essential nutrients and instead have focused on the wrong formula - percentage of calories from macronutrients each day. We can reverse our trend of obesity, diabetes, heart disease, cancer and other chronic disease IF we start paying attention to and focus on what the human body REQUIRES for health - EFA's, EAA's and Vitamins, Minerals and Trace Elements. At the end of the day, it matters little what your percentage of fat is if you fail to meet your requirements for EFA's, matters little if you fail to meet your requirements for EAA's, and matters even less if you also fail to meet your requirements for essential micronutrients. The experts claim that a "balanced diet" that is "nutritionally complete" is one where the macronutrient ratios are 30% or less fat, 15% protein and 55-65% carbohydrate. Where is the evidence to support this? Where is just one menu that proves you can meet or exceed your essential nutrient requirements within this ratio and the menu is whole foods based and one you would want to eat? Where is the long-term data to prove that this dietary pattern, over the long-term, improves your health and well-being? Yesterday I showed a simple, very low-carb menu, created without professional training in nutrition or access to powerful menu-planning software, met or exeeded nutrient requirements, while the menu created by those considered to be "experts" failed miserably. Yet we're told that this failure menu is "balanced," "healthy," and "nutritionally complete." On what planet? Folks, I strongly recommend that before you embark on any dietary change - stop and evaluate the nutrient-density of the menus you're given and told to follow. If the menu is failing to meet your essential nutrient requirements, find a different approach. The long-term consequences of nutrient deficiency are disease and degradation in the body...the exact opposite of what you want to achieve for long-term health and well-being. To lose weight, a low-carb approach can and does dramatically change your nutrient profile - for the better. Depending upon your food choices on a very low-carb approach, you may or may not need a vitamin supplement while you're losing weight - the same can be said of any calorie-restricted diet. I do recommend one as a "safety net" while you're losing weight even though meeting your nutrient requirements is possible on a very low-carb plan and impossible - that's right impossible - on a low-fat diet. Over the long-term a controlled-carb approach maintains a nutrient-dense profile for optimal health. The key is real food - whole food - from a wide variety of food options. In part 1 of my examination of low-carb and traditional dietary recommendations, I stated that the percentage of calories from fat, carbohydrate and protein is not a measure of diet quality. I contend that trying to plan a menu within the "conventional wisdom" of 30% or less calories from fat, 15% of calories from protein and 55% of calories from carbohydrate actually provides LESS nutritional quality than a very low-carb diet! In today's article, I'll show you a side-by-side comparison of two menus - one is a very low-carb menu providing approximately 1600-calories, the second a traditional low-fat menu providing 30% or less calories from fat. To reduce the potential for bias with the creation of a low-fat menu, I'm using a published 1600-calorie menu from the National Institutes of Health, from their website "WIN" (Weight-Control Information Network), part of the National Institute of Diabetes and Digestive Kidney Disease (NIDDK). The very low-carb menu is one that I used myself when I was losing weight back in 2001. 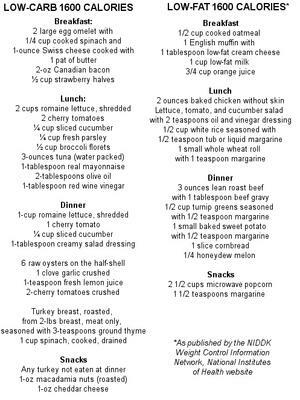 I created it by following the Rules of Induction and the List of Acceptable Foods for Atkins. This particular menu came from week 4, so it includes some fruit - specifically strawberries - while still remaining at 20g net carbohydrate or less for the day. This was one of the rare days that my calories dropped below 1800-calories and one of the rare days that even I was not able to finish all of the food I planned into the menu! So, what is on the menus? Now I bet you're wondering what each looks like for carbs, fats and protein. How about we take a look? The low-carb menu followed just one rule - keep carbohydrate intake at or below 20g net carbohydrates (net = deducting only fiber). The published menu from the WIN website stayed within the guidelines to keep fat intake at or below 30%, protein was slightly higher than 15% at 21% but still acceptable and the carbohydrate content was 55% of calories and provided 25g of fiber. So, from a "macronutrient" view, the low-carb menu is "unhealthy" and "unbalanced" and the low-fat menu is right on target, balanced and well within the recommendations for percentage of calories in a day, right? Just how did each menu do from a "nutrient" perspective? That is, how well did each do to provide essential nutrients? Would you be surprised if I told you that the very low-carb menu met or exceeded RDA's for ALL vitamins and minerals? Don't be - it did. It met or exceeded every RDA for Vitamins A, D, E, K, C, B6, B12, Niacin, Thiamin, Riboflavin and Folate; it met or exceeded every RDA for Minerals Iron, Zinc, Copper, Calcium and Phosporus. And, while there is no RDA for Sodium and Potassium, the ratios for the two were good and intake was adequate based on the Institute of Medicine's Adequate Intake (AI) recommendations, with 2324mg of Sodium and 3565mg of Potassium. So, how did the WIN menu, from the NIH/NIDDK fare nutritionally? In a word - poor. It was deficient in a number of vitamins and minerals. It was deficient in Vitamins D and E.
It was deficient in Minerals Zinc and Magnesium. The sodium and potassium intake was similar to the low-carb menu - adequate intake, acceptable ratios. I don't know about you, but when NIH/NIDDK menu, crafted by experts with access to powerful nutrition software, is deficient, is there any hope that the average person can get a menu that meets or exceeds their RDA for vitamins and minerals when the one published by an "authority" fails? Do you really think it's a good idea to promote menus that are deficient in essential nutrients tot he general public? I didn't think so! As my own menu showed, it is possible to meet and exceed nutrient requirements by choosing nutrient dense foods! Notice my menu contained no grains, no legumes, no pasta, no rice, no cereal and a limited amount of nuts and fruit. Yet, this very low-carb menu exceeded all RDA's. Now, the "experts" are trying to tell you that a very low-carb menu is nutritionally deficient! How exactly is meeting requirements for vitamins and minerals deficient? In fact - the key to eating well and meeting and exceeding nutrient requirements each day is to pay attention to the essential nutrients and NOT the macronutrients as a percentage of your daily calories! Keep in mind too, that if you decide to try a low-carb diet, talk with your physician, have your bloodwork done and skip the processed foods touted as "low-carb" - you don't need them! Keep in mind too, that with time you can and should re-introduce a full variety of carbohydrate foods that you like as you migrate toward the long-term "controlled-carb" approach for life! Tomorrow, in Part 3, I'll provide insight into why nutrient-density is important by reviewing each macronutrient and its role in our diet, why low-carb diets can meet or exceed RDA's for essential nutrients and how the shift from a nutritionally deficient to a nutritionally rich diet improves your health! For years a number of policy makers, agencies and health organizations have established that a "balanced diet" is one that provides no more than 30% of total calories from fat, 55-65% of calories from carbohydrate and 10-15% of calories from protein - regardless of caloric intake. Few challenge the notion that as calories increase or decrease, these macronutrient ratios remain the same; even fewer have taken the time to consider the detrimental effects of ignoring nutrient-density and instead stay focused on macronutrient mix. Let me state it here, the overall macronutrient mix - that is the percentage of calories each day you consume as carbohydrate, fat and protein - is not a measure of diet quality. But few will tell you that straight out and will instead parrot the party-line to have you try to maintain your calorie intake by the useless formula. Even though, at the end of the day, the percentage of your calories from each macronutrient is a moot point - your nutrient-density for essential micronutrients is the key determinant of diet quality. 32.8% fat, 15.3% protein and 50.3% carbohydrate. 36.5% fat, 16.5% protein and 43.9% carbohydrate. The experts will tell us that while we've improved our macronutrient percentages, we've also increased our intake of calories and that is the problem - men are eating approximately 168 more calories and women 335 more calories. The old "it's the calories stupid" answer. Which begs the question - why are we eating more calories? There are a number of reasons put forth - larger portion sizes, easy access to fast food, more convenience food available, eating out more often, liquid calories, yo-yo dieting, lack of willpower, sedentary lifestyles, heck even fewer sidewalks built in new suburban neighborhoods. Few are asking the important question - did a modification of our macronutrient intake have an unintended consequence on our satiety level and ability to control food intake, and thus calorie intake? Research investigating the metabolic effects of low-carb and controlled-carb nutritional approaches reveals that when macronutrient mix is modified to restrict carbohydrate and increase protein and fat (as a percentage of calories) an interesting thing happens in the metabolism - high satiety levels with a spontaneous calorie reduction without counting calories! Yet, the "experts" continue to caution that low-carb diets are potentially unhealthy and no better than calorie-restricted or low-fat approaches; that in the long-term you're better off following a diet that maintains that 30:15:55 ideal formula so you can continue with it once you've lost the weight. The strongest caution cited is that low-carb diets encourage eating high amounts of fat - about 60% of calories each day while one is losing weight! Good grief that sounds high, doesn't it? But...if someone is eating 2600 calories a day today, while they're overweight, just what does a very low-carb diet do to their fat intake if they reduce calories to 1600 each day? Surprisingly, very little. In fact, their intake of fat would increase just 10g - or about 2 teaspoons of olive oil. Hmmm....so why are we being told that to follow a low-carb diet means you have to substantially increase your intake of fat? I don't know why - but if you actually start looking at the numbers, NOT the percentage of calories each day, the real increase is in protein, not fat. And the evidence suggests that more protein in the diet actually is the driving force for greater satiety and the "metabolic advantage" to burn more calories. This increase in protein is in stark contrast to the protein intake on a calorie-restricted, low-fat diet that insists macronutrient intakes must remain at 30:15:55, causing a significant decrease in protein intake when followed according to the percentages! As you can see, on a very low-carb approach, there is NOT a significant increase in how much fat is eaten, even though the percentage of calories from fat significantly increases. However, on a calorie-restricted, low-fat approach, protein intake as a percentage is the same, but intake by the gram significantly decreases! In fact, it's a 39% decrease in protein intake which is a direct 39% decrease in amino acid intake. Not only that, but due to the restriction on fat intake - limited to 30% of calories - the quality of protein sources are significantly impacted as one tries to maintain the fat restriction and is forced to limit quality protein sources that also are higher in fat content, like nuts and eggs. The data available shows that controlled-carb approaches - from Atkins to the Zone - offer a much greater intake of essential nutrients - amino acids, fatty acids and vitamins & minerals - when compared with traditional low-fat approaches. At the end of the day what matters most is essential nutrients not what percentage of your diet was fat or protein or carbohydrate. Tomorrow I'll compare, side-by-side, a 1600-calorie very low-carb menu with a 1600-calorie low-fat menu and detail what each provides nutritionally at the end of the day. It will be an eye-opener! You may remember the article I wrote back in July - Death by Inflammation - where I detailed some of the detrimental effects of low-grade, chronic inflammation in the body. Well, last month the International Journal of Obesity published a study from researchers in Portugal that provides insight into how low-grade inflammation is often tied with other markers of metabolic syndrome - central obesity, hypertension, dyslipidemia, and insulin resistance. The researchers concluded: Present data show that increasing severity of metabolic syndrome is associated with increasing CRP. Additionally, we found that central obesity and high blood pressure are the most important determinants of the low-grade chronic inflammation present in metabolic syndrome. As I noted in my previous article, CRP is a protein produced and released by the liver during inflammation that is associated with increased risk for hypertension and heart disease. The most critical aspect of both metabolic syndrome and chronic inflammation is poor nutrition - damaged fats, AGE's, trans-fats, nutrient deficiency and too many highly refined foods in the diet. Adding to the burden of poor nutrition is stress, sleep deprivation and poor lifestyle choices such as a lack of physical activity - all things one has control over in their life. This study adds to the mounting data that what you eat and how you live has a profound effect on your health. It is never too late to start on the right path to health and well-being. Take small steps and build upon those good habits you develop with each step you take. Eating well is the best gift you can give yourself in both the short-term and the long-term! In this month's Journal of Clinical Endocrinology & Metabolism, researchers from the University of Michigan and Veterans Affairs Medical Center report their findings in Effects of Dietary Carbohydrate Restriction with High Protein Intake on Protein Metabolism and the Somatotropic Axis. In this particular study, healthy individuals were recruited to participate in a controlled environment study that required them to remain hospitalized during the study. At the start of the study, participants were fed a standard western diet of 60% carbohydrate, 10% protein and 30% fat for two days. The diet was then modified to provide 5% carbohydrate, 35% protein and 60% fat for seven days to assess and measure the skeletal muscle fractional synthetic rate, whole-body proteolysis, and plasma concentrations of insulin, GH, and IGF-I. The results surprised the researchers, who like many of their colleagues, believed that low carbohydrate diets cause muscle loss. Never mind that study after study has shown that carbohydrate restriction with adequate protein intake has a muscle sparing effect - old notions die hard! In this study, researchers measured muscle breakdown, called proteolysis, as the rate of appearance of the amino acid leucine into the plasma. This is a much more sophisticated approach than simply measuring nitrogen balance, which has been measured in previous studies. Here protein synthesis was measured by the incorporation of labeled leucine into muscle tissue through a muscle tissue biopsy. The data showed that during the low-carb diet, protein was being broken down and synthesized at the same time. The researchers concluded that the increased protein in the diet led to the increased muscle synthesis, while the lowered insulin caused an increased protein breakdown. Problem is, the researchers didn't bother to measure the net effect and only showed that both mechanisms were simultaneously in action in the body. Without this critical data, the researchers position that the sum of the two determines whether one is in overall muscle building or muscle wasting mode is unfounded due to lack of supporting data. Now, granted, that does sound logical - but don't you think it would be better if it were based on actual data measures? I do! Based on other research data available, we know that the body builds and repairs muscle while also breaking down protein to clear cellular debris, much of which is protein. This study shows that these dual mechanisms in the body were at work while participants followed the low-carb diet. From a metabolic point-of-view this is a good thing - it showed that the body is not exclusively catabolizing - or breaking down - muscle, but is also busy building new muscle. As I already noted, the researchers did not measure the net effect, which is too bad since previous data suggests low-carb approaches actually have a muscle-sparing net effect on the body. Perhaps in the next study this critical data will be gathered to allow for a greater understanding of the net effect low-carb approaches have on lean body mass? In this month's Journal of the American Dietetic Association, researchers published their findings in a study designed to measure the impact of a low-carbohydrate/high-protein diet compared with a high-carbohydrate/low-fat diet on ratings of hunger and cognitive eating restraint. For six weeks, participants (premenopausal overweight women) a low-carbohydrate/high-protein diet or a high-carbohydrate/low-fat diet. At baseline fasting body weight (BW) and an Eating Inventory were conducted prior to start, week 1, week 4 and at the end of week 6. Participants in the low-carb diet group were instructed to limit their carb intake to 20 grams or less per day for the first two weeks, then to increase carbs by 5 grams per day each week, bringing their daily total to 40 grams of carbohydrate by the last week of the six week study. Other than this restriction, the low-carb dieters were not instructed to limit total food intake. Participants in the low-fat diet group were given more specific restrictions; they were to limit their caloric intake to between 1500 to 1700 calories per day and to consume these calories as 60% carbohydrate, 15% protein, and 25% fat. Relative BW loss was greater in the low-carb vs low-fat group at week 6 - those following low-carb lost 44% more body weight! Without being told to do so, the low-carb dieters reduced caloric intake to an average of 1420-calories per day - the low-fat group surprisingly averaged just 1395-calories per day...meaning the low-fat diet group ate less calories yet lost less weight compared to the low-carb group. Particpants who followed the low-carb diet not only experienced less hunger at the end of the first week and at the end of the study, they reported they had less hunger than they had before they had begun to diet. Both diet groups reported increased cognitive eating restraint, facilitating short-term weight loss; however, the decrease in hunger perception in the low-carbohydrate/high-protein group may have contributed to a greater percentage of BW loss. If you're searching for a dietary approach that not only allows for weight loss (heck, don't all diets allow for weight loss?) but also provides a level of satiety and satisfaction with food options, consider a controlled-carbohydrate approach. There are many to choose from and with the help of your physician, you can try it and see if it works better for you than traditional low-fat, calorie restricted plans! The August issue of the open-access journal, Nutrition & Metabolism, featured a commentary by researchers from the University of Connecticut, Storrs - Jeff Volek and Cassandra Forsythe - The case for not restricting saturated fat in a low carbohydrate diet. On point and supported by the evidence, the commentary was in response to a review published by Drs. Arora and McFarlane in the same journal - The case for low carbohydrate diets in diabetes management. The point of contention in the commentary from Volek and Forsythe was not the use of low carbohydrate diets for diabetic management, but the recommendation to emphasize mono and poly unsaturated fat over saturated fat to achive calorie balance on a low carbohydrate diet. In their conclusion, they stated that "[W]e believe that the recommendation to restrict saturated fat in favor of unsaturated fat on a low carbohydrate diet is unnecessary and may even diminish some of the beneficial physiological effects associated with carbohydrate restriction. At the very least, the food restriction required to reduce saturated fat will compromise the palatability of the diet and ultimately the acceptance of the approach to diabetes management recommended..."
Both of these articles are worth reading through - they're grounded in science and use evidence as support. What's more important is that the two taken together show how respected scientists can work through differences of opinion by highlighting evidence worthy of consideration that may have been overlooked in previous reviews. While some may see the point and counter-point as simple disagreement that takes one research team to task, I see it as the evolution of science and our understanding of the evidence that is a necessary part of the process that enables science to progress and perspectives to shift to evidence-based approaches! What do you do when the data from studies contradict each other? Let's tackle that question later and start by examining a recent example. Health Sentinel reported on recent research that found the rate of spina bifida and anencephaly birth defects has fallen by more than one-third since the addition of folic acid to the nation's enriched flours, rice and pastas in 1998. But wait - research published in the American Journal of Clinical Nutrition back in November 2003 found that higher rates of spina bifida and neural tube defects in infants whose mothers consumed higher levels of sugar and the highly refined carbohydrates found in potatoes, white bread and rice and many popular breakfast cereals. It is noteworthy that white bread, pasta and breakfast cereals in the United States are fortified with folic acid. Well, apparently the glycemic load in the diet is as important as the level of folic acid or folate one ingests. In the recent study, the review was on overall incidence of neural tube defects, which have decreased. The earlier study specifically reviewed dietary habits of mothers who had a baby born with a neural tube defect and found those women ate a diet higher in sugars, refined foods and starchy selections. So each study approached the importance of folic acid from a different perspective and thus reached different conclusions. The earlier study is very important - it underscores the importance of the overall diet a woman eats while she is pregnant...it is not enough to just eat foods fortified with folic acid, one must eat a nutrient-dense diet that is has few, if any, highly refined foods, even when those foods are fortified. While the more recent data is being used to push for higher levels of fortification, it does not address the reality that the overall diet in America is poor. Adding higher levels of nutrients in the fortification process may sound like a solution but fails to address the real problem - poor dietary habits that include low intake of leafy green vegetables, legumes and other nutrient-rich non-strachy vegetables that provide excellent sources of folate naturally. I was a bit shocked by the Heath Sentinel's sentence The natural form of the vitamin is found in green leafy vegetables, whole grains and citrus fruits, although it is less easily absorbed by the body. Before fortification, how exactly did women get folate? Hello! They ate vegetables, whole grains and fruits - as part of their daily diet and did not depend on supplements or fortified foods! Have we actually forgotten that real food provides all the nutrients our bodies need if we eat a nutrient-dense diet? While I understand that something must be done to prevent neural tube defects, and that folic acid is known to reduce the risk, I recognize we have a real problem when the solution offered up is more fortification and not education about eating right. Which brings me back to my original question - what do you do when the data seems to conflict? You review more evidence and then bring the pieces together to form a more complete picture to make a decision. In this case, there is ample evidence to suggest that pregnant women must adjust their diet to include more whole foods and pass on the highly processed foods during the pregnancy. Pregnant women must be told, in no uncertain terms, that what they eat while they are pregnant has a significant effect on the outcome of the pregnancy and strongly encouraged to eat a nutrient-rich diet filled with real, whole foods. Hey, it's only nine months of giving up the soda, cakes, cookies, french fries and other highly processed foods - a "sacrifice" that may have a lasting lifetime impact on the health of the child. Now isn't that worth it? Who knows, after the baby is born, mom may even find she prefers eating a better diet and will continue with it for years to come too! CalorieLab Calorie Counter News today reported on an article in the Center for Science in the Public Interest newsletter that suggests sleep time - or lack of adequate sleep - is correlated with a higher body weight. In a study conducted in New York, researchers found that those who slept 6-hours or less a night were 23% more likely to be obese than those who slept 7 to 9-hours a night. One possible explanation is hormones - specifically leptin and ghrelin - that regulate eating. Sleep affects the production of both hormones and a lack of sleep may be affecting how the two are regulated in the body. The article also puts forth the possibility that more awake time provides more time to eat as a possible explanation, along with potential skewing of the data with sleep apnea in more obese people than normal weight people. Quite frankly the article failed to dig deeper into the role sleep plays in our weight and health. There is ample evidence available to provide more insight to readers about the importance of sleep and the potential reasons lack of sleep may increase weight and have a negative impact on overall health. We know, for example, that it is during sleep that the body takes time to repair and build tissue - something it cannot do effectively during waking hours. If we short-change the body of sleep, it will make due with the sleep it has, but will not be working at optimal levels for health. We also know that it is through sleep that the body addresses inflammation, something that in the long-term is detrimental to the body. Without adequate sleep, inflammation may persist and continue to do damage or grow worse. Lack of sleep time is also associated with higher incidence of diabetes and insulin resistance, both associated with a much higher prevalence of obesity. In a study published back in April in the Archives of Internal Medicine, researchers found a similar association in sleep time as noted above with the association tied to diabetes and insulin resistance, not simply weight. In that study, those who slept less than 6-hours a night had an increased prevalence of diabetes and insulin resistence when compared with those who slept 9-hours a night. The researchers noted, Because this effect was present in subjects without insomnia, voluntary sleep restriction may contribute to the large public health burden of DM. Sleep is important to our health - it allows the body to recharge and regenerate; reduce overall stress and inflammation; and wake with the body ready for the day instead of trying to just make do with too little sleep. Imagine my surprise this morning to wake up and find a "google alert" in my mailbox that this blog - my blog - is among the Top Ten Low-Carb Movers & Shakers of 2005! The list, compiled by Jimmy Moore who writes Livin' La Vida Low-Carb, includes many I have great respect for - Jonny Bowden, Lora Ruffner and Neal Beaty, Dana Carpender and Andrea Mondello - all were educating consumers about low and controlled-carb long before it was fashionable, and I have the honor to know personally. These are folks who were there long before low-carb was trendy and remain even after the storm - and all share my own respect for the scientific evidence that shows controlled-carb nutrition is an effective approach to weight loss and maintenance as well as improving health. In addition Jimmy included Dr. Michael Eades and Dr. Mary Dan Eades who authored Protein Power - two incredible people who have worked hard to educate consumers for well over a decade now about the benefits of protein in the diet. I've recently added Dr. Mike's blog to my list of recommended blogs. From across the pond, one of my favorite people, Hannah Sutter made the list with her business partner, Kevin Dorren! Yeah Hannah & Kevin! They started a company called GoLower! to create nutritious selections of protein bars and snacks. Her company and its products are one of the few I will personally recommend because Hannah is doing it right - she pays attention to the ingredients used and the nutrient-density! Hannah's blog is also among my recommended links. Lastly, Jimmy included a few I am less familiar with, but after a quick review of their sites - they too are providing good information I recommend you take some time to read...Andrew DiMinio who is President and Founder of CarbSmart; Jacqueline Eberstein, R.N who co-authored Atkins Diabetes Revolution; and Julia Harvey who is a master motivator at eDiets.com and author of Awaken the Diet Within. Thank you Jimmy and congratulations to all who were named on the list! While living in a major metropolitan area can offer many perks from the variety of restaurants to the array of places to shop, one negative remains - life moves along at a pace where "hustle and bustle" is an understatement. To step back and get away from it all, my husband and I try to find out of the way locations that offer serenity, beauty and total relaxation without telephones, cell phones, television or even a major newspaper when we have some time off. This past weekend provided one such opportunity and we headed out to the backwaters of western Virginia, deep into the Shennandoah Valley - more than 250-miles from home. The town name doesn't matter, suffice it to say it was in the middle of nowhere and could have been named "Paradise," with everything about this town idyllic - incredible mountain views, a running creek right outside our Bed & Breakfast, hiking trails, fishing, a clear night sky with more stars than you can imagine not obscured by the city lights and air that is fresh and touched with dew in the morning. Just a breath-taking location among many throughout the United States that millions get to call home each day. The only downside - lack of access to good food - why I called it "Food Hell" on our first day there and am more convinced than ever that this is contributing to our alarming rates of overweight and obesity in the United States. We arrived very late on Friday evening and when we awoke the next morning, we found breakfast awaiting us. It was simple fare - white bread french toast with fake maple syrup, banana nut muffins made from a mix and chunks of canned pineapple. In addition there was some instant oatmeal we could make along with some cold cereals and skim milk. I looked at my husband and said "what am I supposed to eat?" as I scanned the selections hoping I missed something offering some nutrition - maybe some yogurt or even some nuts. I actually felt like a bit of a food snob and almost considered just eating what was available since it was only a few days anyway. But, good habits are hard to break...so I walked across the street to the small general store in hopes of finding something more suitable. It was there I started to realize just how slim the pickings were - the general store was no bigger than a DC-Metro area 7-11 and had about the same type of selections available - frozen foods, packaged cakes, candies and other junk food along with soda and beer. This was the town's grocery store. While a bit disappointed, I persevered and plucked a yogurt from the refrigerator (a brand that I'd never buy at home since it was loaded with high-fructose corn syrup) and a package of cheddar cheese (processed cheese food) to hold me over until I could get to the next town to pick up some groceries for the rest of our stay. Little did I know that my 17-mile drive to the next town later that morning was in vain. When I arrived I found one small grocery store. It couldn't be called a supermarket since it too was just a hair bigger than a 7-11. As I meandered through the aisles, I was struck by the fact that there were no healthy selections to be found - the produce was limited and mostly grown in hothouses, there were no organic selections and not one 100% whole grain bread was to be found among the soft squishy loaves of white bread that littered the bread aisle shelves. What I did find in abundance - processed foods - everything from hamburger helper to macaroni and cheese - neatly lined up in boxes on the shelves throughout the store. With lunch fast approaching, I did my best to put together an adequate lunch in the hope that perhaps the next town might provide something better. So a quick dash through the produce section and I had a plump pink tomato and some romaine lettuce, at the deli I picked up some roast beef and sliced cheddar and in the bread aisle finally settled on a soft rye bread, the closest thing I could find to a whole grain bread. We'd make do until I could find something more nutritious. After lunch I dropped off my husband and father-inlaw to fly fish until dusk and took the time to drive to another town with my son - this one some 25-miles away. My mission - some healthy foods for the rest of the weekend and some dinner for all of us that evening. I should have called it Mission Impossible - again, the town grocery was a sorry excuse for a market and had virtually nothing worth eating. The options to eat out were worse with restaurants that included Dairy Queen, Pizza Hut, Hardees and a family restaurant that served only deep fried fare. The next and last town I drove to was no better and I finally made some choices from the limited ones available and headed back. I was starting to regret my decision not to pack a cooler when we left for the weekend. Over the years I've learned that a grocery store is often far away from the remote locations we travel to and instread of trying to find one, I'll pack a cooler with basics to have on hand. This trip was different - it was our first major weekend away with our son and the car was jam-packed with necessary items for him - a cooler was just too much to add to the already bursting at the seams load in the car. Now, I questioned my decision to pack the stroller instead of the cooler. One of my major pieces of advice is to "shop the outside aisles in the grocery store" for those seeking a healthier selection of foods. In three different stores I found my own advice to be crazy-making...even I was finding that making good selections was difficult and I do this everyday! Case in point - where is the plain yogurt? Silly question when the only items in the dairy case that are called yogurt are high-fructose corn syrup sweetened or brightly colored take-offs of cold cereal (Trix). What about some cheese? With not one block of cheese available bearing the "real seal," the only selections were processed cheese food. Surely there must be some whole grain cereals or breads? Nope - just instant hot cereals and lots of boxes of brightly colored cold cereals along with breads I wouldn't feed to the birds. The meat case had no organic selections and the cuts that were available were all fatty and from feedlot cattle; there was no fresh fish; no organic or free-range poultry or eggs - basically nothing I would recommend one eat on a daily basis. This was literally Food Hell. For those who live in these isolated areas that are truly a paradise, their hell is lack of access to nutritious food. And it's taking its toll on their health and well-being. In the small town where we stayed, I met just two people who would be classified as "normal weight" - everyone else was either overweight or morbidly obese and their children were already on the road to adult obesity. I spent some time chatting with one of the normal weight women and learned that she ate only organic foods and grew much of her own produce. Our conversation started the second morning we were there as she set out our breakfast - this morning was biscuits with sausage gravy, orange juice and muffins from a mix. I asked her if perhaps there was anything else available that I could make, like some fresh eggs? Within a few minutes she returned with a plate of eggs, fresh cut canteloupe and goat milk yogurt for me. In our conversation over breakfast she told me how years ago she realized, as an grossly overweight woman, that something in her diet was wrong - each time she dieted she lost weight only to gain it back later. So she decided to do something radical almost 15-years ago - she got a goat for milk to make cheese and yogurt, a couple of chickens for eggs, started a vegetable garden and learned how to can and preserve foods. She stopped eating any food that was in a box, bag or jar that had a shelf life longer than she expected to live. Within a year she was normal weight and has since maintained her weight by eating only whole foods, mostly from her own hand in her garden and from her land. Once a month she travels some 72-miles each way to an organic supermarket with a cooler and stocks up on the things she can't grow herself and keeps a full freezer of meats, fish and poultry. She does this because she values her health and has recognized how poor the packaged, processed foods that are readily available are for her weight and health. As only one of two normal weight individuals I met in this tiny town, her story is telling about the importance of nutrient-dense foods as the mainstay of ones diet. She called herself the town "food nut" as others have labeled her - but as she said, her weight is normal and her health at 54 is stellar...that speaks volumes when she looks around at her neighbors who eat a highly processed food diet and are overweight with numerous health conditions. They might enjoy their food but they haven't made the connection that it's robbing them of their vitality and taking years off their life. While we stayed just one weekend and loved how this sleepy town offered peace and quiet and relaxation we could never find in the hustle-and-bustle of our hometown, I have a new appreciation for the abundance available here - a choice of organic markets to shop, roadside farm stands and local farmers markets, and even the large supermarkets catching on to the growing number of consumers demanding organic and/or whole foods for their families. Yes, in the future I'll still seek refuge from the hustle-and-bustle, but I'll also remember to pack the cooler just in case I find myself deep within Food Hell again!